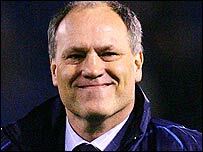 Tottenham boss Martin Jol has been named Barclays Manager of the Month for December. Jol's award follows a fine run of form which saw Spurs collect 13 out of 15 points on offer in the month. Spurs' run saw them rise six places in the Premiership table to a position where they can eye a possible European football finish. Jol has transformed Spurs since taking over following the departure of former France head coach Jacques Santini. "I'm always a bit worried when I win these awards," Jol told BBC One's Football Focus. "Things always seem to get worse afterwards, that's the only worry I have! "But it's not about the games that have gone. We play Chelsea this weekend, and then we have a lot of other important games in the next few weeks. "I have confidence in my team and I think we will continue to do well."